It's here. The event that, eight years ago, put a super adhesive seal between myself and the activity of cycling. The TD Bank Five Boro Bike Tour starts tomorrow, so it's time to visit DIYBIKING.COM archeives and look up the Five Things I Can't Live Without on the Five Boro Bike Tour list as well as my experience riding last year. This year, as my fellow veteran Five Boro Bike Tour riders know, is a little different. Now some of those differences have obvious potential benefits (i.e., staggered start times to prevent bottlenecks) but Bike New York has also made a lot of other changes to this great event – some of which I would have approached just a little bit differently. For instance, this year, Bike New York started a lottery system for tour entry, so instead of a first-come-first-serve method, I had to pay a nonrefundable fee of a few dollars for my lottery ticket – just like tens of thousands of others. I assume this was done to subtly make a bit more on the transaction but more importantly to make it easier for people who have never done the tour before to be able to do it. Another way this could have been done is to provide a registration date for newcomers separate and earlier from that of the start date for veterans – and the veterans, who are presuably kept track of via addresses, credit cards and e-mail addresses in Bike New York's computers – when they pre-registered, they are automatically enrolled (whether they make it in the tour or not) for a really cool prize drawing, which would give them an incentive not to pretend to be newbies. I can also guess why they didn't mail out the packets this year (with vests, the little magazine, and rider numbers). They wanted to save money on postage, but in the survey they did last year, they also probably learned the folks weren't spending a whole lot of time at the Festival at Fort Wadsworth. Personally, I felt that problem had to do with logistics: at the festival, there's a road between the scattered exhibitor booths and the food. If they put several small free food and drink stations among the booths (climbing the Verrazano-Narrows Bridge into Staten Island can make one fantasize about such things) they probably would have the proper traffic for the exhibitors. But by making someone go to Manhattan up to three days before the tour to visit Bike Expo New York does give valuable traffic to Bike Expo New York. The thing that niggles me is that I worry that doing this may reduce the diversity of the tour. When I ride the recumbent down to the start line, I often see cars parked here and there with bikes being pulled off of Thule racks – cars obviously driven from far away on the morning of the tour. Because I live in Stamford, which is practically the sixth borough, I can get in and out of Manhattan in the days before the tour relatively easily. If someone is coming from many states away (or even different countries) and has limited time to spare, they may not be able to do the tour at all. I know they can use proxies to pick up their packet, but still. Also – and here I'm scraping the bottom of the well of complaints – is the way Bike New York did the packet pickup itself. I got an email from them (as I know many of you readers did) that read in the subject line: “TD Bank Five Boro Bike Tour Proceedures at Bike Expo New York” I know they spelled the word 'procedures' wrong in the email - and that's not what I'm complaining about. They spell it right on the web site and I have speling and grammatical errors in this blog awl the time. It's the use of the word. Getting your gall bladder removed. Having your stomach stapled. Colonoscopies. Those are procedures. The subject line could have been a bit cheerier with: “Countdown to the Five Boro: How to pick up your tour packet at Bike Expo New York!” or something like that - not a complaint; more like a pet peeve. Finally, you have to bring a copy of the rider number email they sent you (and a photo ID) when you pick up your packet. I haven't had my computer hooked to a printer since George W. Bush was in office – not that those two things are connected – but they should have either allowed people just to bring a scrap of paper with their rider number on it or a cell phone screen shot of the email to show to the packet pickup people. And – now digging into the earth's crust underneath the otherwise shallow well of complaints – is they need to follow the example of banks, Marshall's department store and homeland security checkpoints: one line, many registers. When I arrived yesterday afternoon, I was put into a line that was, according to one volunteer, a little shorter than the others. But I felt like I was waiting longer than I was. So those are the negatives I've found. Here are the positives: after you pass through the first set of lines, the system makes sense because you're instructed to enter a line that corresponds with your rider number, so yesterday afternoon I picked up my packet quickly, easily and in an exchange of smiles with a great volunteer at Bike New York. Also, if you're within half a day's drive to Manhattan (whether you're trying to pick up your packet for the Five Boro Bike Tour or not) Bike Expo New York is actually quite cool. Don't let the unassuming hall at Basketball City fool you: inside it is a cyclist's Nerdstock. I got there by riding my Dahon Matrix (which doesn't get to ride in the tour but is still the best bike I have for short-range city travel) to the corner of South Street and Montgomery street by heading from Grand Central terminal to the East Side Greenway, which runs near FDR drive. It was a short and pleasant ride that took me right to the bike valet parking provided by Transportation Alternatives. 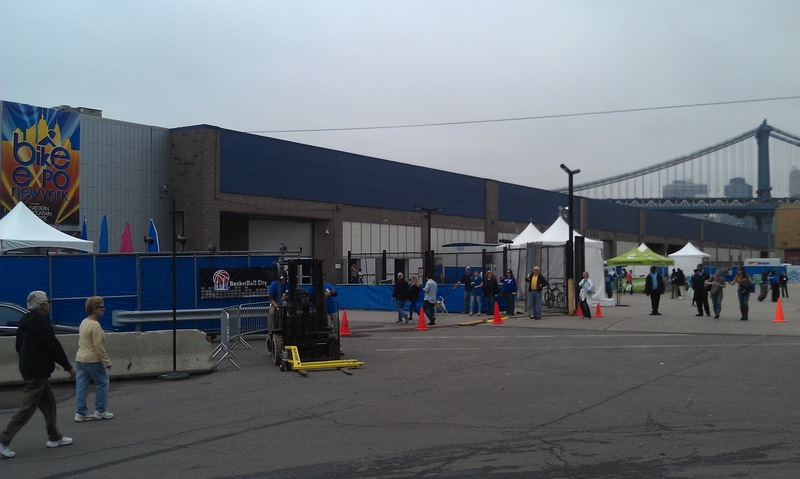 Then, inside Bike Expo New York, you can make a beeline to the packet pickup area by walking to your immediate right and following the easy to read signs hanging overhead. Once done, you get to mingle with some nice people and great exhibitors including Rolling Orange Bikes, World Bicycle Relief, Worksman Cycles (why they don't have one of their excellent ice cream cart bikes or quad cargo bikes at their booth is a mystery to me), Metro Bicycle Stores, Momentum magazine, Zigo and their cool baby carrying tricycle, Montecci, Bike Friday (I told them both about Folding Bike Week) and others. Vaya Bags, which makes panniers, messenger bags and other nice products with recycled sailcloth and old bike tubes, also has a booth with some of their products for sale. So if you don't bring a bag with you to put your Bike Expo loot in, you can buy one there. So, I know that a lot of people may be grumbling at the changes to this years' Five Boro Bike Tour, but if you can get to the Bike Expo New York or knows somebody who can, make sure you head to Manhattan today to check it out. I will be spending today caring and feeding the museum piece I'll be riding at the tour on Sunday, so I will see you then.